The Multi-Grade Classroom framework contemplates the various specific conditions in rural education and sets up the structure so as to offer help to educators to covey classrooms, curriculum, syllabus, etc., seamlessly to individuals. The Multi-Grade school is the main feasible school arrangement is formulated to centre around enhancing the teaching and learning conditions for student’s mental and physical growth. EduSys’s Multi-Grade classroom exhibits an amazing instructive tool for advancing autonomous and individualized learning. This sorts of teaching and learning is an incredible focal point since the education program is acclimated to the explicit needs of the individuals and consequently adds to better learning results. 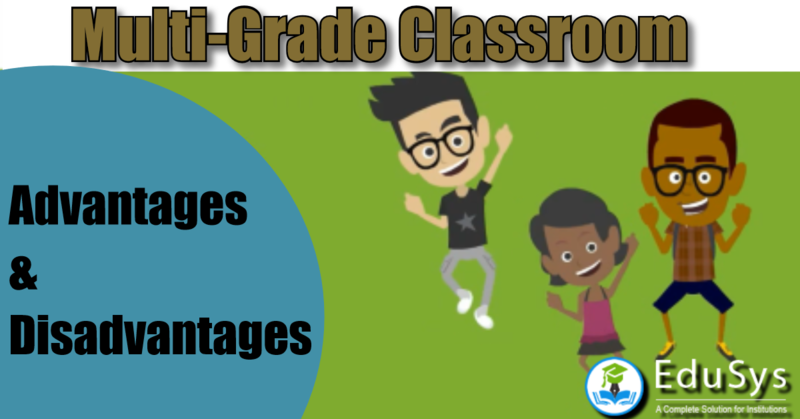 What are Advantages and Disadvantages of Multi-Grade Classroom? A Multi-grade class brings together students and teachers while preparing better stages of development in a learning environment. Student-Teacher Relationship: A Single teacher, or the group of teachers responsible for the multi-grade classroom, typically stay with same students until they graduate to the next level. This garners the opportunity for students to work with the same teachers for several years instead of having to meet new teachers at the beginning of each new school year. Pre-learning and Re-teaching: Students are continuously exposed to re-teaching, as they listen in on, and benefit from lessons which are being taught. Students are also exposed to pre-teaching. This both prepare and stimulate the young students thinking.